Textiles are an important part of our everyday lives. They bring form and function to clothing and room design, and come in a variety of colors, patterns and textures. To make the fabrics we use more interesting, a variety of textile design techniques are available for those who wish to try them at home. These can add color, pattern or visual interest to even the plainest material. Add color to textiles in a variety of ways. Adding color can enhance visual interest and aesthetic appeal, and can add personal touches, designs or styles. 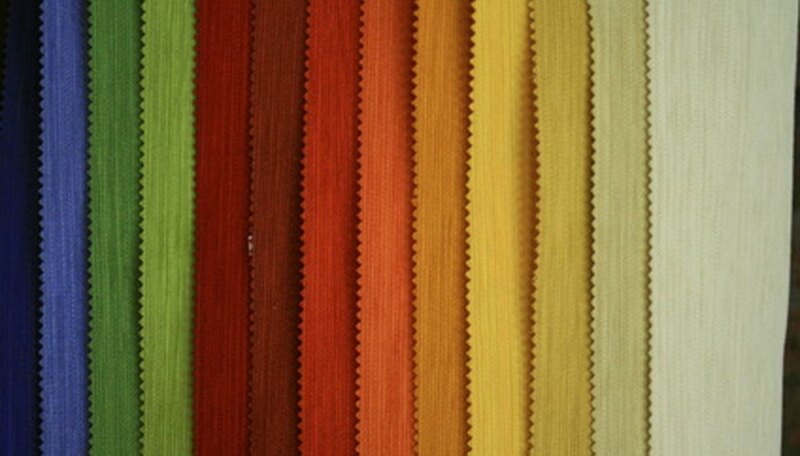 There are several ways to achieve a color or an effect on textiles, many of which will involve some kind of dye. One popular dye technique is also one of the easiest. Tie dye is done on any woven fabric that has been knotted and tied with rubber bands. Bright colored dyes are applied and create vivid patterns on the fabric. Additional options include space dyeing, a style of yarn with different colors on each thread, used to create visual effects on knits, woven patterns and embroidery. Fabric paints, markers and crayons are also options to add color to fabrics. Embroidery can be done by hand or by machine and has origins that date back several centuries. The process works by pushing a needle with thread or yarn into a piece of fabric to make a pattern or design. It is most popular when applied to clothing, furniture and household décor, but can be found in other places. There are two basic types of embroidery -- one by which a pre-made design is sewn onto the material, and the other by which the entire design is stitched by hand into the material. Mastery can take years, but newcomers can start with the top stitch and use an embroidery hoop to hold the fabric tight and flat, making the action easier. Decorations for textiles are widely varied and can come in just about any color, shape and pattern imaginable. Beading, sequins and piping are all simple design techniques that can be done at home to enhance a textile. Another technique is distressing, which is the act of making a new material look old. Denim most commonly receives this treatment, and can cause fading, tearing and feathering of material. A third option is adding lace, braid, ribbon or tassels as trim around the edge of the textile. For those who decide they want to take their home-based design work to the next level, there are commercial techniques that are typically done on a larger scale and usually require more sophisticated equipment. For instance, screen printing involves ink passing through a mesh screen to create an image on the material. This is preferable when creating a large number of items. To add different photos, words or designs, digital printing is the most versatile of textile design techniques. Designs are created digitally on a computer and transferred to the fabric using special printing machines. This is the most common method of designing furniture, curtains, lampshades and bedding.